For standard reservations a one night deposit will be charged at the time of reserving. Our standard cancellation policy is 7 days prior to arrival, after which time a one night penalty will apply. Reservations for Fantasy Fest (Oct 22nd 2019 - Oct 27th 2019), Christmas & New Year (Dec 23rd 2018 - Jan 1st 2019) (Dec 23rd 2019 - Jan 1st 2020) a 50% deposit is required at the time of booking with a 60 day cancellation policy. Minimum stays may be applicable on weekends and during holidays and special events. If you have chosen a non refundable category the balance in full will be charged at the time of reserving. In the event of cancellation no refund will be issued. There are no refunds for early departure or for cancellations due to travel difficulties or inclement weather excluding hurricanes. Please contact us directly for our hurricane policy. Any changes or cancellations to third party reservations such as Booking.com, Expedia, Hotels.com etc. or their affiliates must be cancelled with the same third party the reservation was originally booked through. Refunds where cannot be processed until we receive a cancellation notice from the applicable company. In the event you are a No Show on your scheduled arrival day the first nights deposit will be applied to the first night of the reservation, and any applicable cancellation fees. The remainder of the booking will be cancelled automatically at 10:30 am the following morning unless we hear from you. The Duval Gardens strives to maintain a quiet ambiance for all our guests. We therefore do not accept Spring Breakers and bachelor /bachelorette groups. We are an adult only facility and do not accept children. Duval Gardens is a smaller property and we have found that larger groups meeting collectively on the property, whether for breakfast or in the evening, changes the dynamic, accessibility of services and ambiance we strive to provide for all our guests. We therefore limit reservations to 4 rooms, 2 guests per room in order to maintain the romantic atmosphere our guests have come to expect. This applies to bookings reserved directly, through our website or through any third party booking service. Our property is strictly reserved for registered guests only. Rates are based per room per night. Rooms accommodate two people maximum unless otherwise stated on the room category. All rooms are Non Smoking. The Duval Gardens does not accept pets. Check in time is between 3:00 - 6:30 pm. For arrivals after 6:30 pm instructions will be provided on you confirmation letter. Check out time is 11:00 am. Should you arrive prior to check in time, if the room is ready we will be happy to allow early check in, we cannot however guarantee this. Please be advised that online reservations are not confirmed until the required deposit has been charged and you have received a follow up e-mail from us. We reserve the right to reassign a reservation to a different room type. However, if a room is reassigned, the new room will be of equal or greater value than the room originally reserved. In most cases this will result in a room upgrade. In the rare instance that the room is not available when your booking is received we will notify you as soon as possible. Reservations are confirmed by room type only. Due to generally high occupancy levels specific room numbers or locations cannot be guaranteed. Stairs may be required to access some rooms and no elevator is available. Should you need a ground floor room, this must be communicated at the time of reserving and is subject to availability. Limited parking for compact vehicles only is available on a strictly first come first serve basis for $20.00 per day. Duval Gardens Bed and Breakfast. 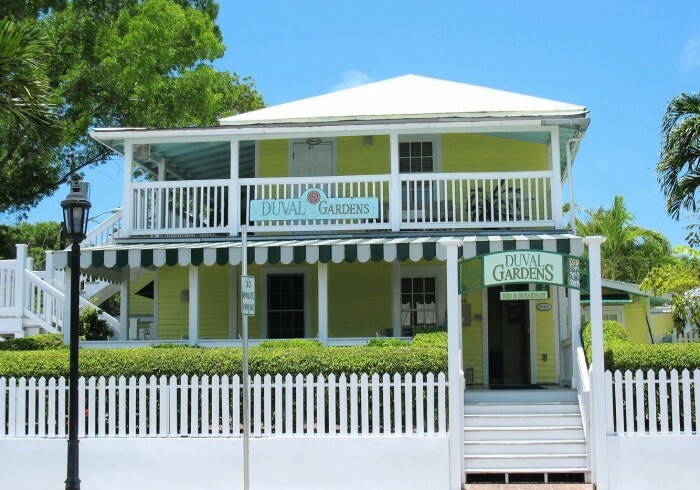 Located in the heart of Key West on historic Duval Street, just steps from the Earnest Hemingway home and museum and the Key West Lighthouse; walking distance to all Key West has to offer. The Southernmost Point, Key West Butterfly Conservatory, Mallory Square, Fort Zachary Taylor State Park, South Beach and Sloppy Joe's are all located withing a 3/4 mile radius of the property. All rooms feature private bathrooms and mini refrigerators. Breakfast is included and served continental buffet style on the front porch overlooking Duval Street each morning. The perfect spot to enjoy your complimentary welcome to Key West glass of wine or cold beer. With a small pool for cooling off in on a hot summer afternoon, this 12 room property is situated in the ideal location for your Key West vacation.